UP Old Age Pension List 2018 Check Latest News on Rs 1,000 per Month Scheme Registration for Labour (Mazdoor) working in India. On Thursday 15 September Labour of Uttar Pradesh announced pension scheme for Senior Citizen, above 60 years who in categorized sector. UP Old Age Pension Registration 2018 From 1 January 2019 UP Government will launched 1,000 Vridha Pension scheme for labors. There were two scheme integrated in CM Yogi Pension Scheme i.e. Atal Pension Yojana, 2. Deen Dayal Upadhyaya Bima Yojana. 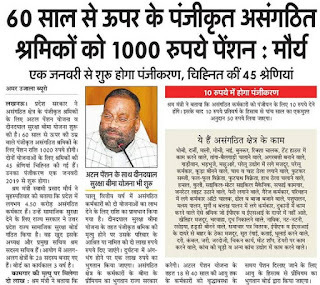 Total 4.5 Crore said to in List of BENEFECIARY Labour PENSION SCHEME which almost totals population of European counties like France. Vridha Pension List UP: - UP Government has made website to check and track status of Vridha Pension @ sspy-up.gov.in/IndexOAP.aspx. However 1,000 per month (45 Dollar Per month) is not suitable to any old person because at that time many types of problem (From Family to Muscle Problem, Body Ache,) faced by Labour. So government should also give Health Insurance of Ayushman Bharat Yojana. Labour Law in India: - Indian People are very hard working and they give 100 percent whatever work they provided. From Gulf Nation to America and European Countries many IT Professional, Labors go to work for earning more and more money. Senior Citizen Pension Scheme After 60 Years: - At Rupees 10 per Year Nominal Charges charged to Asangathit Karmkaro Registration Fees. Up to Five Years 10 Rupees taken which will be onetime payment of 50 Rupees. Pension after 60 years: - Below are list of Labour and Its Areas of Job profile. Dhobi, Darji, Mali, Rikshawala, Auto Chalak, Tanga Bailgadi, Agarbatti Bananey waley, Samachar Patra Vitrak, Doodh Valey, Matasya Palana, Murgi Palan, Dukanon mein kam karney waley etc.